The tribal saris, scarves, and woven fabric lengths of the Koraput-Bastar and Adilabad region are traditionally woven in a heavy count cotton ranging from 10 to 20. The weaver uses a three-shuttle interlock patterning, which allows for innumerable combinations in scale and volume. The characteristic natural dye colouring is derived from the aal or madder dye (Morinda citrifolia) extracted from the root of the Indian Madder tree. The powerful and vibrant colours ranging from deep maroon to dark brown depend on the age of the root bark and the proportion of the dye used and is obtained with the addition of harikari or sulphate of iron. These colours combined with the natural unbleached off-white colour of the yarn produce dramatic results. The designs used have an underlying symbolism and are largely inspired by nature or by significant objects of daily use. The motifs woven depend on the tribe and occasion for which it is being woven. The decorative simplicity of the motifs is set off to dramatic advantage by the background of unbleached kora cotton that has a strong contemporary appeal. 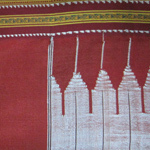 The weavers are now creating textiles with much finer counts in widths to suit the urban market.